1. Sticky food items. 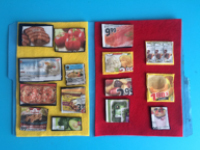 Use grocery store flyers to cut out a variety of food items. Laminate them and stick them on colourful pieces of felt before cutting around the contour of each one. Stick two pieces of felt inside a file folder. Deposit everything inside a brown paper grocery bag that you can hand to the child in the car. Encourage the child to help you prepare your grocery list, plan dinner or even your weekly menu by sticking the required food items inside the file folder. Of course, be sure to offer pictures of food items that you wish to purchase or serve. 2. Building words. 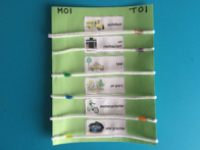 Print several pictures (see "Picture game" section in educatall club). Using a permanent marker, write a word corresponding to each picture at the bottom of each card. Laminate them and punch two holes at the top of each card. Stack the cards and insert a ring inside each set of holes to create a small illustrated tablet. Print each letter of the alphabet several times and stick a small piece of Velcro (female side) behind them. Under each word, stick a strip of Velcro (male side). Place everything inside a small backpack. Children will enjoy identifying the letters that make up each word and sticking them under the pictures in the correct order. 3. Who will see it first? Glue several different pictures vertically in the centre of a piece of construction paper. You can, for example, use a picture of a pink car, a picture of a yellow car, a picture of a brown truck, a picture of a white bus, and a symbol associated with a popular restaurant. Under each picture, glue a colourful pipe cleaner on which you have threaded a large bead horizontally, applying glue only at each end of the pipe cleaner. At the beginning of the game, the beads should be directly under the pictures. Write the child's name in the top left-hand corner. Write "You" in the top right-hand corner. Give your illustrated board to the child in the car. If you wish, you could place it in a gift bag with a picture of a car on it. 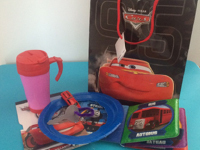 Search for the illustrated items as you drive and encourage the child to do the same. If the child sees one of the items first, he must slide the corresponding bead under his name. If you see an item first, the child must slide the bead to the right, under "You". When you arrive at your destination, check to see who found the most items. 4. Interactive map. Before leaving, draw a simplified map to your destination on a large piece of cardboard that can be folded like a map. Glue pictures representing things that you will see along the way (church, school, soccer field, playground, restaurant, etc. ), making sure to add them in the order you will see them. Deposit the map in a miniature suitcase or a lunchbox with a picture of a car on it along with several stickers. As you drive, help the child notice the different reference points on the map. Every time you reach a reference point, the child can add a sticker to the map, next to the corresponding item or location. Ask the child what you will see next. The trip will fly by since the child will be busy and feel as if he/she is helping you stay on the correct streets or roads. He/she will be your personal navigation specialist. 5. Magical Ziploc bag. 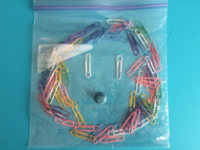 Fill a large Ziploc bag with colourful paperclips. Seal the bag and glue it on the lid of a cardboard box. Provide a large magnet and show children how they can slide it over the paper clips to move them around and create a wide range of designs and shapes. 6. Driving with... Purchase a small gift bag with musical notes on it. Set an old MP3 player containing songs sung by a familiar character inside along with the corresponding puppet and a few picture books. If possible, add small individually-wrapped snacks featuring the same character. Children will love travelling with their favorite companion. 7. Original stories. Remove a colourful page from a somewhat damaged storybook. Use a hole-punch to make holes here and there on the scene. Use hot glue to stick one end of a string (not too long for safety reasons) under a few figurines. Thread the other end of each string through one of the holes and glue them under the scene. Children will have fun creating different stories with the figurines and the figurines won't fall to the ground. If you wish, you can use a gift bag representing the corresponding figurines to transport everything. 8. I can drive too. Slide a plastic steering wheel (or a cardboard version), plastic keys on a cute keychain, sunglasses, and if you wish, a drink in a leak-proof cup inside a black bag. Children will enjoy using these items to pretend they are driving like you. Encourage them to turn to the right, to the left, use their flashers, honk their horn, etc. 9. Emergency lights. Purchase several toy versions of emergency vehicles (police car, ambulance, fire truck, etc.). In general, these vehicles fascinate little ones. Simply deposit them in a small doctor's kit that can be left in the car. Every time a child sees one of the vehicles, he/she can take the corresponding toy version out of the bag and play with it for a few minutes. Children will love showing others which emergency vehicles they saw when they reach their destination. 10. Busy on the road. Print several "Educ-intruder" activity sheets (available in the educatall club). Laminate them and arrange them in an attractive binder. Place the binder in a small backpack along with a washable marker. Children can use the marker to circle the different items hidden in the scene. 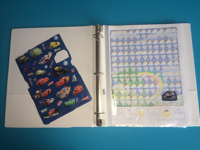 With younger children who may be tempted to draw on car seats or windows, offer large stickers they can stick on the items they find.